Amber Road’s (NYSE: AMBR) mission is to dramatically transform the way companies conduct global trade. As a leading provider of cloud-based global trade management (GTM) software, trade content and training, we help companies all over the world create value through their global supply chain by improving margins, achieving greater agility and lowering risk. We do this by creating a digital model of the global supply chain that enables collaboration between buyers, sellers and logistics companies. We replace manual and outdated processes with comprehensive automation for global trade activities, including sourcing, supplier management, production tracking, transportation management, supply chain visibility, import and export compliance, and duty management. We provide rich data analytics to uncover areas for optimization and deliver a platform that is responsive and flexible to adapt to the ever-changing nature of global trade. Key routes such as the Silk Road, Spice route and the Ancient Tea Route blazed the trail for manufacturers, importers, exporters and customers – the world changed from a domestic to an international landscape. It is from that important trade lane, reflecting international reach and value, that we took our name – Amber Road. The extensive capabilities found in Amber Road's global trade management software are made possible by an on-demand platform that unifies the offering with common code, data storage and schema. By delivering global trade management via the cloud, Amber Road gives customers the flexibility to access their critical compliance and global logistics processes from anywhere in the world. Managing successful supplier relationships requires a great deal of collaboration. Given the added complexity of global vs. domestic shipments - different languages and time zones, longer lead times, complex trade regulations - collaborating with foreign suppliers is even more difficult and more important. By centralizing and automating these processes, Amber Road accelerates the movement of goods across international borders, enhances compliance and reduces global supply chain costs. Amber Road is powered by Global Knowledge®, the industry's most comprehensive database of trade compliance content and international business rules. Global Knowledge has been amassed by our team of in-house trade experts since we began offering GTM solutions. This team monitors and updates global trade regulations on a daily basis to ensure our customers have the data they need for the highest levels of import/export compliance and accurate landed cost calculations. 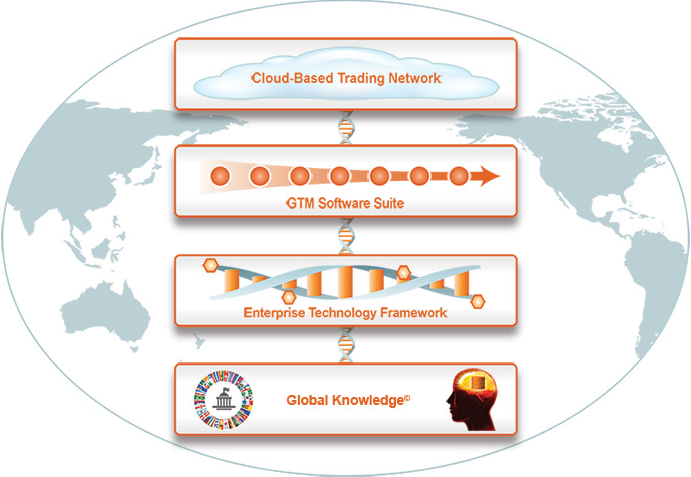 Amber Road has built a global trading network with pre-established connectivity to over hundreds of trading partners. The network's secure data communication services enable suppliers, forwarders, transportation carriers, and customs brokers to share supply chain information and alerts that are critical to the timely delivery of goods. How Would Your Company's Supply Chain Benefit From Digitization? With more and more companies engaging in global trade - importing and exporting goods around the world on a daily basis - the need has arisen for a platform that automates and streamlines global trade. Amber Road provides a single, on-demand solution that does just this.